Classic Gazpacho with Avocado & Mango is the perfect summer meal for a hot day or night! PSA: Don't forget to enter this week's Back to School giveaway where we're sharing stories from the good ol' days (jk those days were not so great haha). Also, our Costa Rica yoga retreat is happening in November! I'd love for you to join us! And, we're down to our last few YBC Holiday Mantra Boxes - our awesome discovery box - so order now if you'd like one! Lastly, if you have the YBC App and take a min to review it, send a screenshot of your review to Lauren and we'll send you a little something in thanks. While I was out in Michigan visiting my husband last week, I had an entire day to myself while he was on the road. It was one of those beautiful days that perfectly blends summer and fall, and has just the hint of a chill in the air. It was toward the end of my stay, and I thought I'd make a big ol' pot of soup so my husband could have some to bring to work in the coming days. Pin it! GAPS friendly tomato soup. Monday was one of those perpetually grey, drizzly days that are perfect for a homemade soup. I was craving tomato soup so I picked up the tomatoes, along with celery and carrots and hoped for the best. The only thing I would've changed is the amount of carrots I used- I think one less would've made it perfect. For a garnish I used our homemade sour cream. Sour cream is ridiculously easy to make, is a healthy, healing probiotic food and an essential component to the GAPS diet. You can get the recipe in my eBook (along with a bunch of others, yoga sequences and meditation prompts) for free when you sign up for the YogaByCandace newsletter. 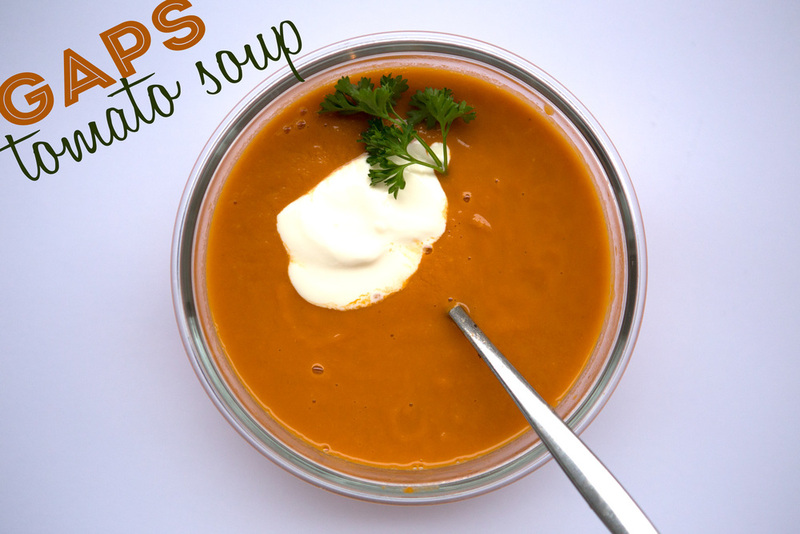 GAPS diet butternut squash soup. Pin it! Butternut squash is one of my favorite cold weather foods. Whipped in the blender with a little butter is my favorite way to eat it, but the other day I switched it up and used it as the main part of a soup. It came out creamy and filling, but not too heavy, and was so good we had it for lunch the next day.